Squared (often referred to as ‘Google Squared’) is an educational initiative developed and launched by Google London in 2012. It’s catered to people working in the advertising and creative industries and encourages learning by doing and action over theory; training participants to affect change in their industries behaviour and methods by understanding how technology impacts society. I was fortunate enough to discover Squared when it was first introduced and instantly identified with their vision and way of doing things. However, I had always felt that their branding was severely lacking. It wasn’t congruent with their can-do attitude and innovative teaching methods. In July of 2013, I had a new vision for the future of Squared. So over a couple of weekends, I created a conceptual rebrand of the programme. This experiment focused on giving the brand a bolder and more powerful voice, capturing the team’s ambitious mission and vision for the initiative. The project was shared heavily on Twitter, leading to useful feedback from thousands of people around the world – many of them designers. Not long after publishing the conceptual rebrand, I met the small and passionate Squared team at Google London and in October 2013 they hired me to re-imagine the Squared brand from the ground up, for real. Here’s a brief overview of the journey we took to give a new face to their groundbreaking educational initiative. Approaching this in the right way was key. I needed to put myself in the shoes of a ‘Square’, so I immersed myself in the brand by devouring every piece of course material and marketing collateral I could get my hands on. I joined the participant groups online to follow their discussions, studied the photos from Squared events and attended one of their prototype workshops at Google London, to understand what it feels like to learn with the team. Squared is more than just an educational programme, it’s a network. The Squared students and the people they work with are shaping the future of an industry that has infinite potential to be better; more relevant, less obtrusive and with far better ethics. These are the people who will be running the place in a decade, so it’s crucial that they develop the right perspective. What if Squared were more than it is now? If we grew to become Google’s global education platform for teaching the world with the greatest experts, the latest technology and the fastest delivery methods, how would we look and sound? The new Squared brand is the result of these philosophies. The original logo was created back when Squared first began – as a scrappy, skunkworks project at Google London. Now that Squared had matured, such a literal execution wasn’t necessary. The new logo was developed with Google’s design philosophy in mind: simple, abstract and colourful with a geeky undertone. Google’s logo is a great example of an abstract mark done right. A complex and geeky metaphor with a playful and memorable execution. Their product logos follow the same formula, except they’re icons: simple faces for innovative products that are instantly recognised as being from Google. We knew we needed to take the new Squared brand in this direction, but without sacrificing our edge by becoming overly friendly. Squared students often make these playful hand signs when posing for pictures together, similar to how you would mime a ‘frame’ before taking a photo. I saw this during the programmes launch back in 2012 and it had become part of the culture of being a Square. Combining this with the classic Squared brackets created a perfect symbol for the new identity – a frame. The brain acknowledges shapes before anything else. Repeated exposure to symbols is what allowed brands like Apple and Nike to become so deeply ingrained in our minds. It’s why road signs aren’t written in text, because they need to be universal and instantly understandable in a fraction of a second. Colour comes next. 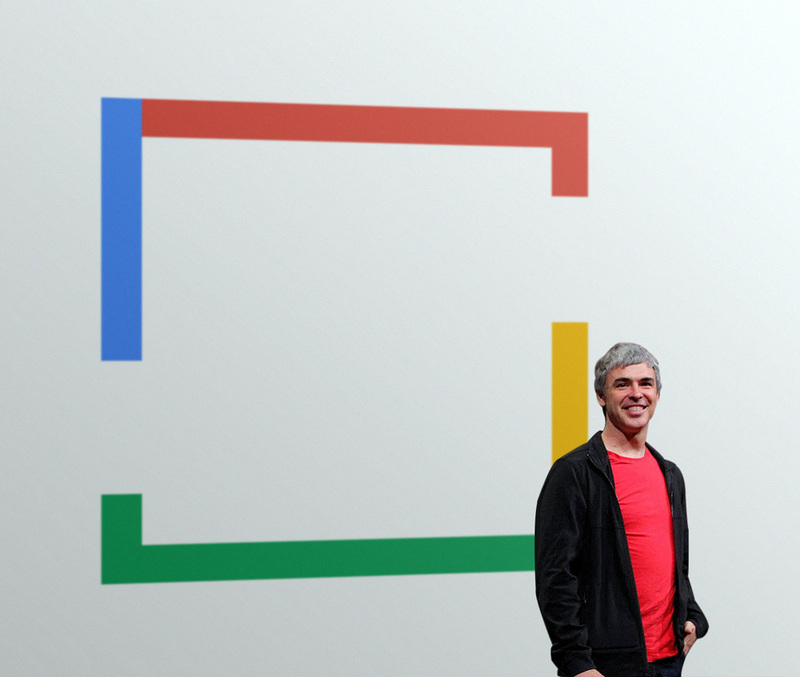 Blue, Red, Yellow and Green are Google’s calling cards. You’ve seen them thousands of times already and you’ll keep seeing them – every time you open the Google homepage. This all boils down to a single ambition for the new Squared logo: one symbol for Squares around the world. Brutally simple, memorable and perhaps one day, iconic. To become ubiquitous, the frame needed to be able to accommodate a wide range of use cases. From collaborations with partners to playful logo illustrations, the frame is a mark you can take anywhere. Although Squared is a Google project, the team’s teaching methods are ‘platform agnostic’. They don’t encourage the use of Google products more than competing services and they’ll collaborate with anyone if it results in a better experience for their students. A Google employee even used the phrase “The Android of education” when discussing their goals for the initiative: developed by Google, but made for everyone. Because of this, it was important to deviate from Google’s typical product logo anatomy and position Squared as a standalone brand. A Google project, but with no bias toward the company. The logo was developed with the omission of the Google wordmark, allowing it to be perfectly visually balanced and independent while still carrying Google’s DNA. One of my initial ideas was to integrate a bold logotype within the frame, completing the ‘S’ that’s implied by the frame. This was powerful, but it felt too overbearing and didn’t scale well. So we chose a lighter, more balanced version using Open Sans – Google’s sole brand typeface. Having a clear voice to represent the new brand was imperative. Our old messaging had begun to feel awkward and clunky – a little too long to be a tagline and too short to be a manifesto. Squared talks a lot about ‘the digital revolution’ (the one we’re in right now) and Google even named their Barbican London art exhibition after it – again, change is a constant for Squared. We knew that the brand should look and feel like the symbol of the digital revolution as a movement. A community with a shared belief system: the belief that the digital revolution is underway, that we’re right on the fringe and that we need to make the most of it. Look closely at core Google products – from the experimental Chromebook Pixel to Google’s marketing landing pages – and you’ll see a simple strip of Blue, Red, Yellow and Green. I’ve always loved this playful touch. Bold, energetic colours against an otherwise stark and minimalist aesthetic. It’s just like the Google homepage. This is the new message for Squared. An idea that projects confidence and utilises what I call ‘the Google accent’. Beyond integrating the Google colours into the new frame, using the Google accent to underscore our message was an even more powerful way of bringing big Google’s DNA to the Squared brand. When paired with an instantly recognisable symbol, Squared becomes the face and the voice of a new movement in education. Welcome to the revolution. Like the new logo, the new tagline is designed to be versatile and global. To really bring this to life, a conceptual ad campaign was created by pairing the new tagline with images from recent history that symbolise the digital revolution. Note: The ‘google.com/squared’ URL is used for illustrative purposes only and is not currently active. Using the new frame and message in combination allows for countless executions. International launches are a great example, evoking the sense that you’re a part of something bigger than yourself. Google’s design philosophy runs throughout the new Squared identity, bringing consistency and authenticity to the brand. To do this, we limited ourselves to using only the core Google colour palette. This helps to keep our messaging focused and congruent with the company that made it all possible. Open Sans is the sole font of the new Squared brand. Ubiquitous online and versatile in print. When we first launched the new identity, we used a set of simple open source icons. When Material Design was unveiled at Google I/O ’14, we updated our branding to use the new System Icons. To hold all of this together and give the new identity focus, an ultra-simple set of brand guidelines were created. They feature all of the standard do’s and don’ts you would expect, but also include easy to follow practices for Typography, Photography, Visual Language and Tone of Voice, helping Squared stay consistent around the world. Communications were drastically simplified across all of the Squared properties. Non-essential copy was either removed entirely or shortened for clarity, making way for clear and concise information with an upbeat tone. The new logo and colour palette is used to create continuity throughout our materials. This idea featured invites via both email and post. In reality, students are invited to Squared via their companies and receive a confirmation email before they join. With this in mind, we needed to avoid having the email feel cold or empty, so we brought the sign-up tasks to the forefront. This is typically participants first contact with Squared – it’s where they tell us all about themselves. Making it feel welcoming while also allowing it to be exciting and even a little nerve-wracking was important. Note: Confidential information has been replaced with dummy text. Like the original Squared branding, the website for Squared Online (a distance learning version of the programme, powered by Home Learning College) was conceived when the project was much smaller and scrappier and the site was in serious need of an overhaul. Despite this, application volumes for the programme are incredibly high, so the new site needed to be both visually aligned with the new Squared brand while also making it as easy as possible to apply to join. A new structure and style guide was developed to established Google standards, using the same visual cues as other Google landing pages. We focused on simplifying the site by cutting unnecessary content and providing a fast, fluid and clear application process. The new landing page even features a shot from Google+ Hangouts on Air, a product that Squared Online students use almost daily to collaborate as they go through the programme. Now fully responsive, the site pares content back even further on mobile, making it lightning fast and showing only the essential information needed to learn more or apply to join. Squared’s bold and direct tone of voice lends itself well to advertising, showing the project for what it really is: a new movement in career learning. When I first met the Squared team, it was comprised of just 3 incredibly passionate and hardworking people operating within one country, but the work they did and the people they inspired (myself included) paved the way for something much larger. Since the rebrand was implemented in April 2014, Squared has expanded globally: launching in Google Singapore, New York, Hong Kong and Germany, educating thousands along the way and becoming the foundation for an even larger international education initiative. Thanks for reading. You can follow me on Twitter, here.